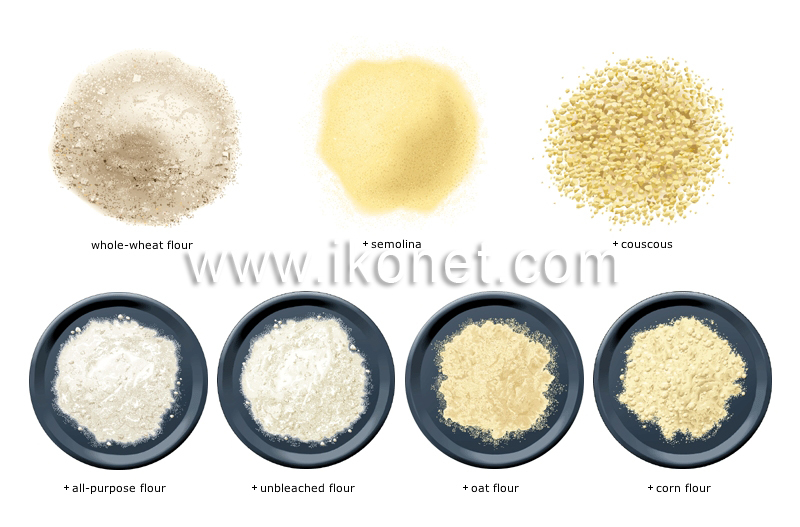 Products obtained by grinding grains and cereals; semolina is usually coarser and more granular than flour. Without a modifier, these words generally refer to wheat. Primarily added to crepe, cake, muffin and bread mixes; it must be combined with wheat flour if the mixture is intended to rise. Like white flour, it comes from grinding wheat grains from which the bran and germ have been removed, but it is not artificially whitened. This blend of ground hard and soft wheat has many uses, but is primarily used to thicken sauces or to make bread and pastry. Refers to the granular flour derived from hard wheat, used to make pasta; fine semolina can also be eaten as a cereal (cream of wheat). Since it does not rise during cooking, it must be combined with wheat flour to make bread and other leavened products; it makes these products heavier. Because it is produced by grinding the entire grain, none of the nutrients is lost; the grain’s outer layer, known as bran, gives it a brownish color. Hard wheat semolina that is formed into grains and used to prepare an eponymous dish of the Maghreb; it is traditionally steamed over broth.